We’ve had such a cruddy spring here in NYC and it’s hard to believe the summer solstice is just a week and a half away. Luckily, it’s been chilly and wet during the work week and sunny and warm at the weekends. It doesn’t make you feel that much better, though. You can’t fully get into the swing of summer because the weather just isn’t matching up. It feels like early April and we’re two weeks into June. Sadness. I want to wear my freaking sandals again and eat dinner outside and not wear a COAT ANYMORE! Venting over. The one way we’re finding we can brighten our rainy, cool day is by cooking meals like this one. Fish (and our Black Cod is sustainable… double happiness) reminds me of the beach, which reminds me of sunny days. Morels and peas remind me of spring which (usually) remind me of flowers and sunny days. Mint reminds me of my garden in the summer which, say it with me, reminds me of sunny days. It was cool enough outside to use my oven, but we could just as easily have done this on the grill. The minty pea puree was fabulous and could have been eaten with a spoon alone. We paired this dish with some sliced Yukon Gold potatoes in their skin, sprinkled with olive oil and some herbs de Provence and crispily roasted in a hot oven. While these are cooling down, you can finish your fish. Here’s to warmer, sunnier days ahead wherever you are! Make your green pea puree by putting a bit of olive oil and the butter in a hot pan. Saute the onion and garlic until soft – about 2 to 3 minutes. Add the peas, wine and stock and reduce by 1/2. Turn up the heat a bit if necessary. Add the ground fennel and stir. Turn off heat and add everything to a blender. Add in basil and mint along with the yogurt. Puree in blender. Taste for seasoning and add salt and pepper as necessary. Set aside. Make morel sauce by heating up olive oil and sauteing onion and garlic until it gets a bit of color. Add the morels along with one tablespoon of butter and allow to saute for about thirty seconds. Now add the wine and stock and reduce by half, slowly allowing to reduce. Could take about 5-8 minutes. When it is reduced, stir in your final two pats of butter. Keep warm until fish is ready. Make fish by rubbing the meaty side (non skin side) with olive oil. Sprinkle with some salt and pepper and some more ground fennel (optional). Sear, skin side up in a screaming hot pan for 2 minutes until a crust forms. Turn over skin side, kill heat. Put into a 400 degree and turn off heat – allow to cook for 8-10 minutes depending on thickness. I think the whole east coast is suffering from lack of sun.. 🙁 But your dish looks great. I just bought fresh peas at the market and want to do something minty and fresh just like your dish! Thanks for the inspiration. I’d gladly trade a little of our sunshine for a plate of your gorgeous fish! I can neither find black cod nor morels anywhere around here. I saw beautiful morels last month in Seattle and I wish I had bought some then. Sigh….. I think this rain is really getting to all of us. I feel like I’d give anything for a week of straight sunshine at this point (although I’d prefer that week to fall on the week of my vacatin). I’m hearing we’re stuck in this weather pattern until at least Wednesday. But you shouldn’t have to wear a coat. Despite the rain, it’s almost 80 degrees out there. 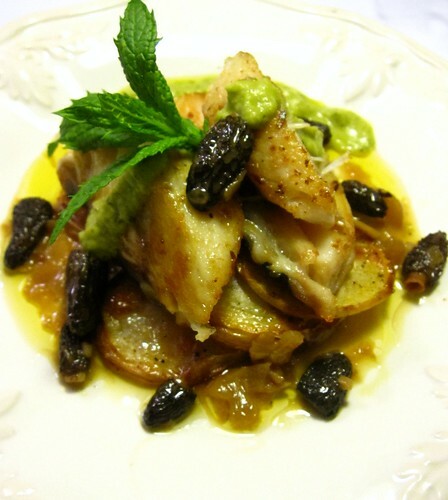 this dish looks great….but morels and puree = sold in my book – hook me up! Love black cod. Such a great, buttery texture. It’s a really good fish. Nice! OMG… this looks so good!. I have made the different components of this piece, but never paired together. Lookin good. Very fresh. Mint pea puree, now this is new to me, I must admit I am tempted. I hear ya…our Spring has been rather “Birningham-like”….rainy, cool and gloomy. Your dish is mucho-elegant…ya got Morels, peas, fresh mint and a lovely cod. What’s not to like? Mint Pea Puree sounds soooo good! Very elegant combinations here. What a gorgeous dish!! Perfect PERFECT flavor combo. And I will drink to nicer weather in NYC — I am SO ready! mint pea puree u say! I likes! nice looking dish. i’d have this for bfast if I had to! Three very distinct flavors going on here and they come together beautifully. Looks like I’m not alone in my admiration for the mint pea puree. OH, totally agree about spring–Cleveland has been the same. But, at least the peas and morels are springy. Oh my, the dish looks absolutely gorgeous! I hope summer arrives soon for you! I commiserate as I much prefer the sun to clouds and rain especially lots of clouds and rain. 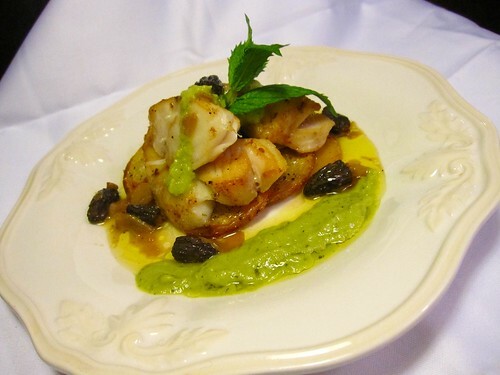 The dish looks delicious – love the minty pea puree – can’t wait to try it. Way to zhoozh up cod with mushy peas. We’re getting cooler weather lately, too, but I like it. We had a warning of things to come a few weeks back, and I am really just not ready for 90 degrees yet. Your recipe sounds wonderful. Black Cod is one of my favorite fish. Peas and Morels, both sauces would be great alone, but that this dish has both, fabulous! This dish showcases the best of the season. Mint, peas, morels just scream spring to me. What a delicious combination. More than the cod and morels i’m excited about the minty pea puree. It just sounds so amazingly refreshing and lovely! Im not entirely sold in the process for the mint pea puree. i would just sweat some shallots in oil, season, then add my peas, sweat, season, white whine, reduce, veg stock, reduce, then cool it. then i would puree with fresh mint, lemon, and a little evoo. then i would heat it up and emulsify some butter. And I promise, yes I promise, that after crisping the skin in the pan for 2 minutes, and then flipping it and putting it into a 400 degree oven for 8-10 minutes, you will be left with a dry over cooked fish! gross! apologies for not being sold in “the process” – did you make the dish? i actually think you are wrong about the fish – of course the cooking time in the oven will change depending on the thickness of your fish. Ours was about 2 inches thick for this dish and the cooking method was quite right and not over cooked or GROSS. and you’re welcome to your method of the pea puree – it’s our blog and that’s how we made it. but i thank you for your version as well. next time, though, please wait to comment on a cooking method until you’ve tried ours and found it to be wrong. we’ll always be willing to change something that could be wrong in our recipe if it’s been tested. ← Breakfast of Champions or Extra Large Tapa? Chorizo Picadillo with Eggs and Pimentón Potatoes.